I attended the 30th annual Circom Regional conference, hosted by SVT in Malmo, Sweden, last week and was amazed by how openly it embraced all things social, web and tech. 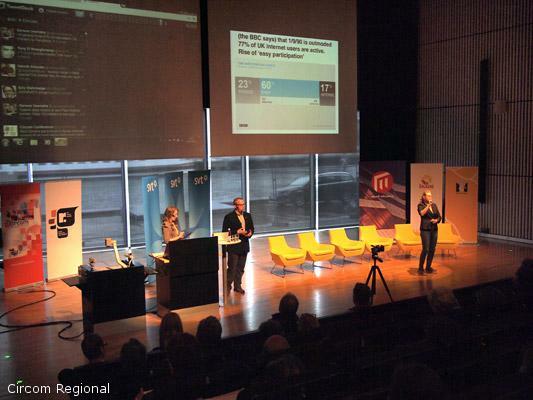 From Mans Adler’s (Bambuser) session on live video broadcasting to Glen Mulcahy’s mobile journalism tour de force and SVT’s group of innovative News Lab journalists, the event was firmly rooted in media 2012. Granted, I’m biased (I was invited to present and participate in a panel discussion) but there was something for most digital-minded people in the television industry – a massive shift from last year’s mainly broadcast-focused conference. #circom with social media you don’t have to cut information (which is not relevant for the wide tv audience), you can give everything! #Circom a good story is always a good story but a good story is always better when it is shared. @cian_mccormack Can social media prove a distraction from the story itself? Or you can watch the full stream back here via Bambuser. If you have any thoughts on the topic, please leave a comment below!